Israelis have had enough of pro-Hamas MK's antics, poll reveals, as legal noose around Zoabi begins to tighten. 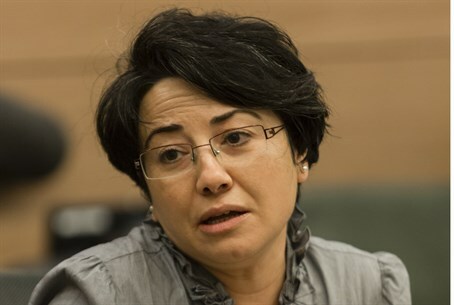 Earlier this week, pro-Hamas Arab MK Hanin Zoabi (Balad) sparked outrage saying that IDF soldiers are “worse terrorists than ISIS," and apparently the latest outburst by the MK is the last straw in the building public rage against her. While ISIS members “kill one person each time with their knife, the IDF [kills] tens of Palestinians with one button,” she said, in an interview with Channel 2, calling on people not to enlist to the IDF or to ISIS claiming "they are both murderous armies, they have no border or red line." The Israeli public has finally had enough, Israel Hayom revealed Thursday: over 85% of Israelis polled have voted to see Zoabi ejected from the Knesset. By contrast, just 11% of Israelis believe that Zoabi - like she claims - is a "paragon of free speech" and that her remarks are warranted within the right to freedom of expression. Calls to convict Zoabi over her frequent outbursts of incitement and pro-Hamas activity have been resurrected after a recent scandal regarding ex-MK Azmi Bishara, the traitorous founder of her party who was exiled from Israel after he was found to be working with Hezbollah terrorists in 2007. Zoabi has been linked to Hamas on multiple occasions, and is infamous for provocative speeches, including one in which she said that Israel has “no right to a normal life” and a later address claiming that “the Israeli occupation” was behind the murder of Israelis in Bulgaria. More recently, Zoabi wrote an article encouraging Hamas on the terror group's website, and was briefly handcuffed during violent pro-Palestinian protests in Haifa. Zoabi has been ejected from the Knesset before. Before the last elections, the Central Elections Committee banned Zoabi, under a clause requiring candidates and parties not to work against Israel's character as a Jewish, democratic state. However, the Supreme Court later overturned the decision and allowed Zoabi to run. But, following last week's remarks, MK Robert Ilatov (Yisrael Beytenu) said Sunday night that legislation to strip Zoabi of her Israeli citizenship would soon be introduced. Foreign Minister Avigdor Liberman (Yisrael Beytenu) likewise vowed to ban the entire Balad party from the Knesset.